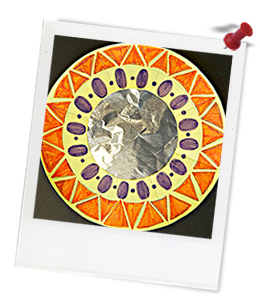 Quick summary: In this lesson, students combine skills in Mathematics and Visual Arts to create mirrors inspired by Mexican folk art. They begin by viewing examples of Mexican paintings, observing similarities in the artworks. They subsequently connect their observations with knowledge and understanding of symmetry to create their mirrors. In this way, the lesson engages students in the interconnected nature of art and mathematics. Students create representations of rotational (radial) symmetry. Students apply a range of techniques from different cultures and times to create works of art. Syllabus outcomes: VAS3.1, VAS3.2, VAS3.3, VAS3.4, MA3‑1WM, MA3‑2WM, MA3‑3WM, MA3-15MG, MA3-16MG. General capabilities: Numeracy, Critical and Creative Thinking, Intercultural Understanding, Literacy. By the end of Year 6, students explain how ideas are communicated in artworks they make and to which they respond. They describe characteristics of artworks from different social, historical and cultural contexts that influence their art making. They work collaboratively to share artworks for audiences, demonstrating skills and techniques. 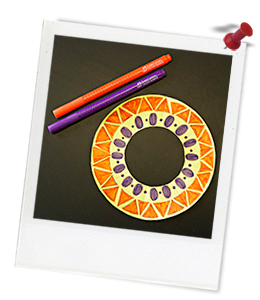 By the end of Year 5…They describe transformations of two-dimensional shapes and identify line and rotational symmetry. By the end of Year 6… Students describe combinations of transformations. They solve problems using the properties of angles. Level of teacher scaffolding: Medium – Students are given explicit step-by-step instructions for completion of the task, however may require support to accurately measure angles and/or trace and replicate their design. Resources required: Device capable of showing videos and projecting examples to the class. Student Worksheet (one copy per student). Folk Art Mirror Step-by-Step Instructions (projected, or one per two students). Decorative Foil Squares (silver sheets) or aluminium foil. Small Kinder Circles (one per student). Coloured pencils and sticky tape (for students to share). Tracing paper. HB pencils and note paper for each student. Keywords: Folk art, tone, art, colour, contrast, pattern, repetition, unity, symmetry, rotation, balance, craft. Students understand rotational (radial) symmetry. Students are able to apply artistic techniques from different cultures and times. ... explain what rotational (radial) symmetry is. ... create works of art with rotational (radial) symmetry. ... share observations about artwork from other cultures. ... apply techniques observed in the work of others in their own work. Art and mathematics are often viewed as very separate disciplines, with art being more of a creative pursuit and mathematics focusing on logic and reasoning. These two areas, however, have many shared concepts. Pattern is a concept relevant to both mathematics and art, just as shape, line and scale all are. What did you notice about the use of shape? What did you notice about the use of pattern? What did you notice about the use of colour and the tones of those colours? The paintings shown did not show much use of texture. What was the impact of this? Explain the inspiration for this artwork. Explain the art elements and principles you thought about when creating your work. Explain how/why you selected the colours included in your design. Explain the presence of symmetry in your design.